If you’ve ever idly wondered what it would be like if the Predator and the Terminator had a child, Monster Breeder is the perfect game to scratch that highly specific itch. 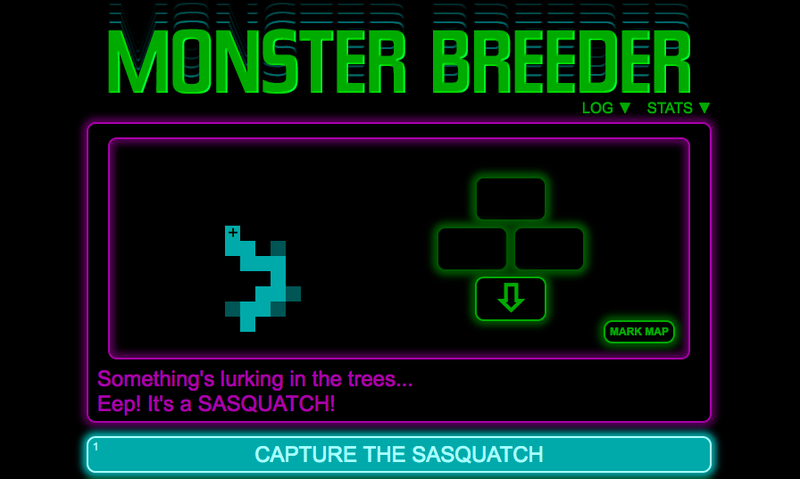 Monster Breeder is an in-browser critter-collecting game by musician Neil Cicierega. Cicierega is best known as the creator of Flash animation The Ultimate Showdown of Ultimate Destiny as well as albums like Mouth Moods. Those works mixed and matched classic cartoon characters and hit songs into wild creations. Monster Breeder does something similar, tasking players with mating well known monsters into bizarre combinations. With enough time, a modest ranch can grow into a mighty monster empire. You explore the game’s world with text prompts looking for monsters to breed and then sell at your ranch. When you breed new monsters, prospective buyers call and ask for specific characteristics. They might want a creature that is bald, undead, and spooky. Sifting through your stable for a ghostly creature will lead to a successful sale and tidy profit. Some customers are actually cops looking to sting the player if they are breeding without an expensive licence. Each sale is a risk, and finding the right monster for each customer provides a quick but fun brain teaser. The first monster I created was a crossbreed of a skeleton and the Predator. To my utter shock, they gave birth to Skeletor. I sold him to an inquiring customer for a pretty sum, bought monster pheromones, and trekked around the forest until I found a wolfman that I eventually bred with Freddy Krueger. Some monsters require special gear to capture, while some are so massive they require upgraded trucks to carry. The loop of combining monsters to buy better gear to catch better monsters is simple but compelling. Most of the fun comes from the variety of monsters you can create. After having made dozens Kruergerwolfs, Gremlinators, and Frankengeists, the game said I’d only found about one percent of the known monsters. While I suspect this number is an exaggeration, there are a lot of critters to find. Occasionally, you’ll stumble across abandoned houses or hidden passages that hold special monsters. I wandered into a child’s bedroom in a derelict house before getting attacked by Chucky and hauling him off to my ranch. Monster Breeder has a wonderful sense of humor, and I can’t wait to breed a shark with a mothman.